The guitar is a versatile musical instrument that allows musical creativity to be expressed very well. Picking notes and strumming chords is great for learning, but it starts to sound mechanical. Here are a few advanced guitar techniques and tricks to make your music more vibrant. As you learn, you will notice that your favorite guitarist uses these very same techniques! Click to view the Basic Guitar Lessons if needed. The Bend is by far the most used guitar trick in the book. As this picture shows, the trick is to push the string with your fingers while fretting it (bending the string). Usually you bend strings with your ring finger, using your middle and index fingers to help. The string tension increases, changing the sound of the note. If you pick the note and then bend the string, you get the classic wail of the Blues guitar. Guitar tab notation is shown here, bends are indicated with an upward arrow (and may also state how much to bend FULL, 1/2 etc). Pushing the string up a little (half bend) will change the sound by one fret (half step), pushing it more (full bend) will raise the pitch by two frets (one step), and once your fingers are stronger - pushing the string all the way will raise the pitch by three frets (one and one-half step). Be warned however, bending strings can be PAINFUL at first, so practice lightly till your fingertips get de-sensitized. The Hammer On is another popular trick. 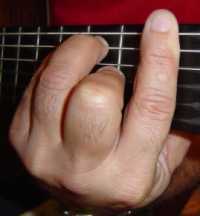 When a note is following a previous note by one or more frets, instead of picking the second note - slam your finger down on the next required fret (while holding the previous note). This changes the note to the fret you have hammered on, and gives a forceful tone to the change. The complementary technique to this is the Pull Off, which works in reverse. When you have a note that precedes a previous note by one or more frets, fret the second note while keeping your previous finger down (don't pick the string) - then forcefully "pull" back the previous finger. The trick is to remove the finger rapidly so it doesn't muffle the string vibration - the result is a forceful note change to the next note. In guitar tab, hammer on and pull offs are marked with an arc linking the frets - if its going to a higher numbered fret then its a hammer on, if its going to lower numbered fret its a pull off. A combination of both the hammer on and pull off is called the Trill - where you rapidly hammer on and pull off on the same fret several times (keeping the first finger in place throughout). This creates an undulating sound that combines both the notes. A very common technique to break up a monotonous stretch of music is the Vibrato. At any point where a note is held (usually for more than one beat, though it works on single beats as well) - instead of leaving your finger on the fret to hold the note, rapidly wiggle the finger (up and down, or side to side). This adds a wavering quality to the note and gives it some feeling. There are many ways to add vibrato, in fact it gives many guitarists their "trademark" sound. BB King for example, does what is called the "Butterfly vibrato" where he extends the other (unused) fingers and wiggles his entire wrist. Palm Muting is another way to get distinctive sounds out of your guitar. Although it works best on an electric guitar with distortion effects - it can also be used on acoustic guitars. Simply allow the palm of your right hand to touch the strings while you are strumming or picking the strings - this creates a flat sound or thump (depending on your gear). On some acoustic guitars that have excessive bass (the fat E string sounds too loud), you can partially palm mute by only touching the high E string - this will reduce the bass effect when you are strumming chords. Guitars are normally tuned to E-B-G-D-A-E notes - however you can also use Alternate Tuning. This changes the open notes for one (or more) strings, completely changing the sound and of course the way you play notes. One popular alternate tuning is the Drop D tuning, where the high E string (fattest E string) is tuned down to D instead of E. Some rock and blues songs use alternate tuning - if you are trying to play one of those songs from tab or sheet music, it would be almost impossible to do so without changing the tuning of your guitar. Normally you can fret upto 4 strings with your four fingers on the left hand, but some chords require you to fret all six strings (such as the F chord). In order to do this, you have to use your index finger to form the Barre or Bar - and lay it flat across the strings and push down. This trick also allows you to create alternate tuning on-the-fly, since your finger behaves like the nut at the top of your guitar neck. You can form all kinds of chords behind the bar, and it is very popular in many songs. Barring with the finger can be tricky, so metal or glass Slides are available to put over your finger - and it makes things a little easier. Some formats of music (and even some guitars) are built entirely around slides, and is called Slide Guitar. These are only a few advanced guitar techniques, click if you need a refresher on Beginner Guitar Lessons.